The Ministry of External Affairs (MEA), in a statement, said the two leaders also exchanged views on regional and global issues during their meeting on the third and final day of the Sri Lankan leader's visit here. 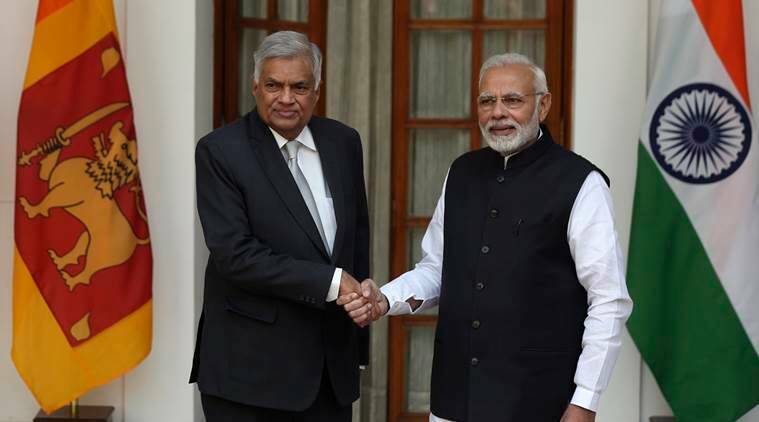 Prime Minister Narendra Modi and his Sri Lankan counterpart Ranil Wickremesinghe held talks Saturday on ways to deepen the “historically close” relations between the two countries and reviewed the progress of India-assisted development projects in the island nation. The Ministry of External Affairs (MEA), in a statement, said the two leaders also exchanged views on regional and global issues during their meeting on the third and final day of the Sri Lankan leader’s visit here. During the talks, Modi and Wickremesinghe reviewed the progress in implementation of various decisions taken during the high level exchanges in the recent past, including Modi’s visit to Sri Lanka in May 2017. They also discussed the progress of India-assisted development projects in the island nation. “This multi-faceted partnership has been marked by close contacts at the highest political level, growing trade and investment, wide ranging development cooperation, increasing linkages in the fields of education, health, infrastructure, connectivity and capacity building and broadening people to people contacts,” the MEA said after delegation level talks between the two leaders. Both prime ministers discussed the entire gamut of bilateral relations and ways to further deepen the “historically close and friendly relations” between the two countries, it said. “Delighted to meet PM Ranil Wickremesinghe in Delhi today. We had fruitful discussions, reviewing various aspects of India-Sri Lanka cooperation,” Modi tweeted after the talks. Key decisions taken in stepping up bilateral cooperation during Modi’s visit to Lanka in May 2017 for the International Vesak Day celebrations, Sri Lankan prime minister’s visit to India in April and November last year, and Sri Lankan President Maithripala Sirisena’s visit for the International Solar Alliance founding conference in March this year, were discussed during the meeting. The issue of India taking charge of operating Sri Lanka’s loss-making Mattala Rajapaksa International Airport in Hambantota was also understood to have figured in the talks. Earlier in the day, Home Minister Rajnath Singh, External Affairs Minister Sushma Swaraj, and National Security Advisor Ajit Doval, also separately called on the visiting Lankan leader. Wickremesinghe and Singh discussed issues related to security and anti-terror cooperation between India and Sri Lanka. In her meeting with the Lankan premier, Swaraj also reviewed the progress of India-assisted development projects in the island nation. Prime Minister Modi also hosted a luncheon for the visiting dignitary.